On a dark day like any other, SHE wages a war. A war on ‘their kind’, who threaten to take what remains of the last shred of hope, SHE holds dear, which is buried deep in the confines of her heart. Surrounded by a darkness that most of ‘their kind’ would much rather escape from than conquer. SHE is a determined warrior, hell-bent on her own salvation at any expense. With her outlook turned very much sour and a lock and key around her core, SHE fights alone in a world of complete ruin. It is in that ruin that SHE meets him. At first glance, SHE is caught completely off guard by his nature. HE is one of them, ‘their kind, yet without any acknowledgement SHE can not ignore the very present fact that there is something new about him. An essence that SHE recognizes, one that SHE has not seen in ‘their kind’ reaching back as far as SHE can ever recall. However, HE is still ‘their kind’, a master at deception and core breaker if SHE ever saw one! Upon their encounter, SHE unknowingly finds herself caught up in a chaotic whirlwind of emotion. So much that, if only for a moment, her core is left unguarded and vulnerable to attack. With natural resolve, SHE fortifies herself and stands ground for an attack for the ages, but no attack comes from him. SHE is concerned greatly, yet all the while, intrigued, why HE is not like the others, at least on the surface. It is this intrigue, that forces her, very much ready for battle, to slowly back away and out of his sight, disappearing from what might have been. In her darkness, SHE deals with the pain, left behind from previous battles with ‘their kind’. Wounded, yet determined to heal, SHE wonders about him. HE seemed to know so much about her pain and the darkness that SHE lived in everyday? But how? ‘their kind’ had not heart, they ruled and conquered, never did they feel any pain, let alone acknowledge it! With a battle looming in another direction, SHE finds herself returning to the same battlefield to find him still standing where she had left him. On a bleak and barren day, like any other, the sound of rock crushing below his feet could be heard as HE walked through the wasteland, that HE had come to call home. HE had wondered into this wasteland after scarcely surviving a battle with ‘their kind’. A warrior who clung to the slimmest of hope for his own salvation from ‘their kind’, who was known for their incredible ability to deceive their way into his core, in attempts of obliterating it from existence. Surrounded by a darkness that often devalued his core to the point that HE would be able to escape most battles, He would survive barely, however, being left with scares that never seemed to heal themselves over. With his outlook bleak and breath of hope, combined with his core hidden so deep that no other could find its location, HE had set his mind to wander his wasteland until his time was finished. It was in this wasteland that HE met her. At first glance, HE was mesmerized by the look in her eyes. For behind those eyes stood the very destruction HE, himself, had witnessed, on more than one occasion! Knowing, ‘their kind’ all too well, HE could not believe what he saw behind those eyes. Still, SHE had a way about her essence. SHE did not hold her poise like ‘their kind’ did, and there was a feeling that rushed through his core that HE had not felt in his life as far back as he could recall. HE stands before her, ready for an attack for the ages. That battle does not find its way in between them, however. This is not like ‘their kind’, he thought to himself. ‘Their kind” attack immediately, why does SHE stand, looking into his eyes? As she slowly pulls away, into the darkness, HE finds himself in an unfamiliar state of mind, one HE had only dreamt about in days past. For the first time, HE secretly has no idea of a direction of travel and for the longest time remains where HE stood when HE first saw her. HE closes his eyes and wonders about her. Why was SHE so different from the others? From the darkness, HE hears a step towards him. HE opens his eyes and sees her. Standing face to face, it was clear to both warriors, that neither would harm the other, although that assumption came at a highly guarded price. He notices her grimace and recognizes her pain. 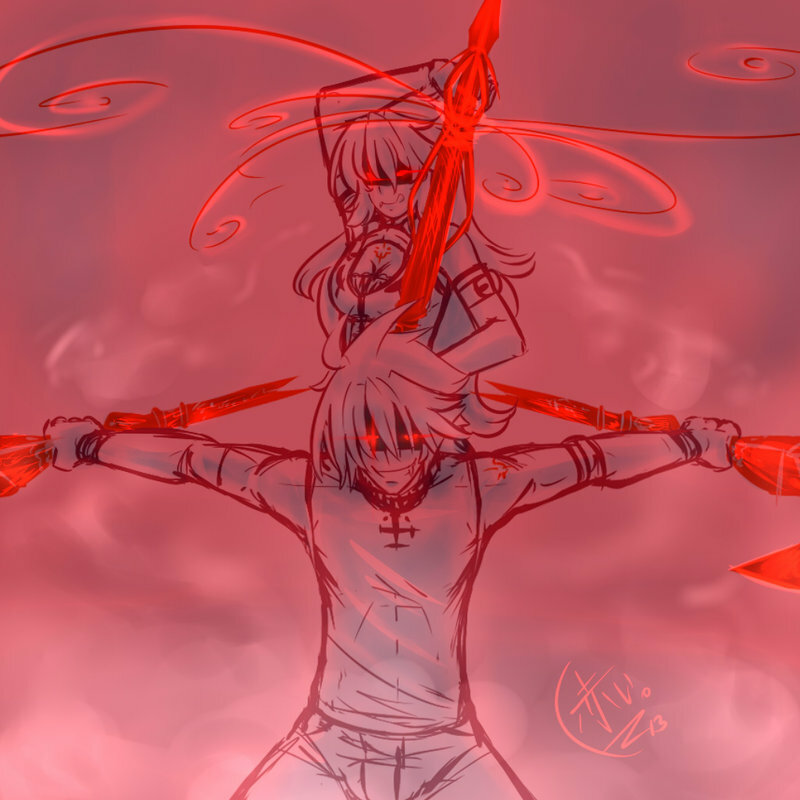 HE slowly makes his way around to her back and notices the blade that had long been lodged within her. With a look of concern upon her face, HE placed his hand on the blade and began to pull with all of his might. SHE began to scream in pain as HE began to take what hurt her most, from her core. Then suddenly, a burst of light raced through her blood, like that she had never felt, SHE was overwhelmed at this sensation. It is with a slight smirk of agony, that SHE realizes why HE is different from ‘their kind’. SHE knows that pain. SHE then placed her hand gently on his shoulder and made her way around to his back. It was their that SHE saw a blade that had clearly been thrust into his core long before SHE saw him. With a look of worry upon his face, SHE placed her hands on the blade and pulled with all of her might. HE screamed in agony as she removed what had hurt him for so very long. It was at that moment a rush coursed through his veins, to the likes that he had only heard about in myth. Facing each other, they compare the blades, to find they are alike, leaving the same scares and causing the same pain. Looking into one another’s eyes, SHE & HE realize that they have found the only other who can be trusted with their cores! Suddenly, the sounds of her battle approaches, SHE takes her blade from his hand and places his into it. Turning to face her battle, SHE stands ready to fight this battle alone. From behind her, the sound of his battle, discovering his location, approached. HE grips his blade and prepares for attack. In unison, SHE & HE wrested into one another. With their backs against the other, both expose a slight grin upon their faces, knowing that the battle against ‘their kind’ would no longer be fought alone. The battles would be fought together… into the evermore! This is so far from what you usually do, but oh my god. This caught me and held on. Is there going to be more? Is it going to be a novel or just a short? Please let me know! Right now it is a (very) short story. The rush I felt while writing this was amazing. It was very intense to write it, but it helps to have a real life feeling behind it’s basis. I reached into a dark part of my soul for this and had inspiration from from someone who has rocketed into my life. It was filled with heart, not that my other works isn’t, it was just that this was so very close to me that it came out into this awesome piece. It was really good, I was wanting some background on how they got into the situation they came to be in. Guess you will just have to write more!